Piano Play-Along Volume 106. 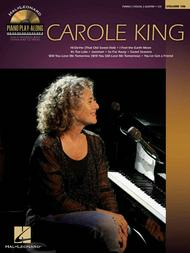 By Carole King. Piano Play-Along. Pop. Softcover with CD. 40 pages. Published by Hal Leonard (HL.312056). ISBN 1423498062. 9x12 inches. Book/CD Pack. 8 songs, includes: Hi-De-Ho (That Old Sweet Roll) • I Feel the Earth Move • It's Too Late • Jazzman • So Far Away • Sweet Seasons • Will You Love Me Tomorrow (Will You Still Love Me Tomorrow) • You've Got a Friend.